[SLAVERY]. U.S. CONGRESS. Pamphlet. Speech of Hon. 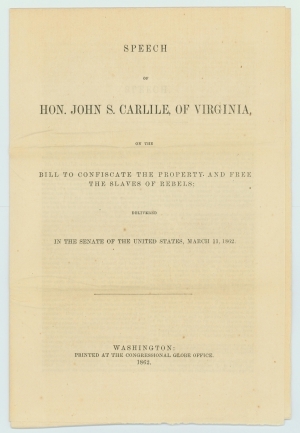 John S. Carlile, of Virginia, on the Bill to Confiscate the Property and Free the Slaves of Rebels; Delivered in the Senate …, March 11, 1862. Washington: Congressional Globe Office, 1862. 13 pp. On March 6, 1862, President Lincoln delivered an important message to Congress, recommending passage of a bill enabling the voluntary, compensated abolition of slavery in the border states, with federal funds for promoting the emigration of freedmen to Africa. Congressional debate over this measure was coupled with the controversy over the role of the Union Army in occupied portions of Missouri, Virginia and South Carolina, in harboring fugitive slaves. On March 13, 1862, Lincoln forbade Union officers from returning fugitive slaves to their owners. In the end, though some Radical Republicans were upset that Lincoln did not yet countenance full and immediate emancipation, the party leadership swung behind support of Army confiscation of fugitive slaves on the frontlines and compensated abolition in the border states. On June 19, Congress passed the Second Confiscation Act, declaring all fugitive slaves behind Union lines as captives of war, liable to be set free. The legislation incorporated provisions for transporting and colonizing any black consenting to emigrate outside the United States. Carlile, as a quintessential border-state congressman, voted against these measures. His speech was impassioned and intelligent, recalling his own experiences defending the Union in Richmond, Virginia in early 1861, at the risk of his life, and recounting a litany of statements from Republican politicians early in the war, attacking the notion that the federal government could unilaterally seize Southern properties. John S. Carlile (1817-1878) was a politician from Winchester, Va., who moved to Berkeley (now West Virginia) in 1842 and established a law practice. He was elected to the state senate (1847-1851), and then to Congress (1855-1857) as a member of the Know-Nothing Party. Carlile was reelected in 1860 as a Unionist, serving from March 4, 1861, until July 9, 1861, when he resigned to fill the Senate vacancy caused by the defection of R.M.T. Hunter to the Confederacy. He served in the U.S. Senate from July, 1861 to March 3, 1865. As a Virginian who stayed loyal, Carlile was a leader in the movement for statehood for West Virginia, but he did not support President Lincoln on emancipation. Congressional Globe, March 10-11, 1862, pp. 1136-1161.